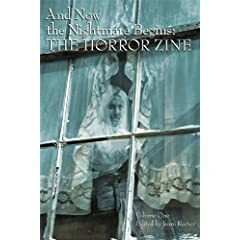 I've just come home to find my copy of 'And Now the Nightmare Begins' the Horror Zine anthology on the kitchen table waiting for me. I'm in it. Alongside Simon Clark and Ramsey Campbell. How cool is that?! I'm also in an anthology called 'Old Magic in a New Age' published by Earlyworks Press. You can buy Casting Shadows from various places. Most people prefer Amazon I think. Follow LINK for UK or LINK for USA. This blog contains thoughts directly from my brain. I simply plug my brain into the laptop or PC via the brainlink USB, and voilà! A blog appears. Author type person. Writes a lot. Loves sleep.